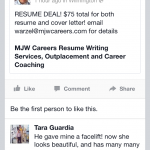 A nice facebook testimonial for our resume writing business! Come get yours made over today! RESUME DEAL! $75 total for both resume and coverletter! email warzel@mjwcareers.com for details!